Investors keen to protect their precious cash have sought security in all the usual places in recent months. The U.S. dollar, the Swiss franc and the Japanese yen  each with a history as a safe haven  have all provided homes for nervous depositors' cash. But as the economies of those three countries flounder, it's time to look around, and smart investors think they've discovered a new harbor to protect them from the choppy economic seas. 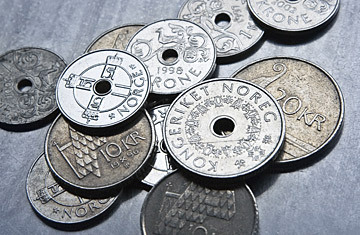 "The best safe haven currency," analysts at banking giant HSBC wrote in a research note this month, is Norway's. According to HSBC's reading, right now the Norwegian krone is "probably the best currency in the world." But the krone's strengths also reflect the current weaknesses of rival currencies. The yen and the Swiss franc had been doing pretty well amid the chaos. The Japanese currency, for instance, rose more than a fifth against the dollar in the last four months of 2008, as previously big-spending investors cashed in risky assets overseas and brought their earnings home. But that's changing. Japan's economy is in freefall. In its latest assessment of the global economy published March 19, the International Monetary Fund forecast the country's output shrinking by 5.8% this year, much more than in the U.S. or eurozone. With interest rates close to zero for months now, there's speculation Japan could intervene to weaken the yen in order to help stoke its all-important export sector. Switzerland's one step further along. In an effort to fend off the threat of deflation, the Swiss National Bank announced March 12 it would dump francs in the first such move by a major central bank for years. The move was enough to cut 3% off the currency's value against the euro; since then, the franc's fallen further still. Even the greenback, which rallied in recent months, stands at its lowest level against the euro since early January following the Fed's announcement last week that it would spend some $1.2 trillion on government and mortgage bonds, flooding the markets with dollars. So while the krone looks attractive in comparison, it's worth remembering that "at the moment, the currency markets are an ugly contest," says Thomas. "Pretty much everywhere looks not great." Moreover, he says, while Switzerland boasts a powerful banking sector with experience of taking in floods of cash, "Norway doesn't have that financial infrastructure. And there's no bond market to speak of." That means that while "it's a nice currency to be invested in, from a practical perspective, of someone who has a huge pot of money and wants a safe haven, they just couldn't put it all in Norway," according to Thomas. "The economy's not set up to be a safe haven." Perhaps it's back to stashing cash under the mattress.